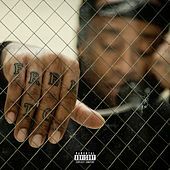 After the 2014 one-two punch of “Paranoid” and “Or Nah” singles, Ty Dolla $ign seems ready to expand sonically and thematically on Free TC. Phone calls with his imprisoned brother TC are interspersed through songs about street pride (“Solid”), the importance of community (“Guard Down”), and difficult relationships (“Credit”). But he always returns to the luxury cars and strip clubs, no matter how “Blasé” they are. He’s got a pointedly male perspective, and compares his women to “Horses in the Stable.” Guests include Kanye West, Future and others.